Journalist Robert Strahorn came to Gunnison County, Colorado in the summer of 1880 to see firsthand what the excitement was all about. 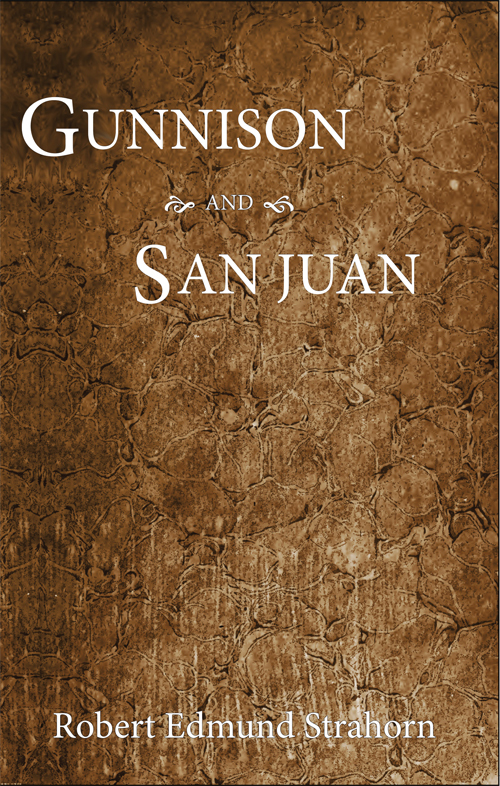 The Utes had been told they would have to leave Colorado, thus opening a vast and rich land to the west of Gunnison to white ranchers, prospectors, and settlers. Strahorn took it upon himself to spread the news about this unknown land and its rich mineral discoveries (most of the area’s mines are described in detail in this book). He recognized the potential of this new frontier’s coal, timber, grasslands, marble, iron, real estate investment opportunities, and much more. The result was this interesting overview of the first few years after mining came to what has been termed Gunnison country, and the formation of the towns of Gunnison, Crested Butte, Pitkin, and Aspen, as well as the present-day ghost towns of Irwin, Ruby, Gothic, Willard, Hancock, Independence, and Schofield. Strahorn wrote of a need for more hotels, machinists, and capitalists with money to help spur the development of this burgeoning area. Then he turned his attention to the San Juan District to the south, and touted that area’s booming towns and mines of the time -- Summitville, Lake City, Animas Forks, Silverton, Eureka, Ouray, Rico and Durango. Strahorn reported that in 1880 “every newcomer is a prospector,” and wrote of the energy and wonder of being in a booming mining district where great stories of striking it rich were heard every day.